With a sleek design and solid manufacturing, our Universal TV Stand is the perfect base for your LCD, Plasma or LED flat-screen TV. Included hardware and easy-to-follow instructions make it simple to install and the stand's anti-scratch bottom also protects your furniture. 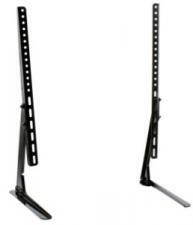 - Fits flat-screen TVs from 15" - 32"